Decorative extras that liven up a space or add a touch of flair to an empty space in need of something. The variations are endless as it can be used for walls, doors, cabinets or ceilings. Imagining all the possibilities is what youll find to be the most fun. 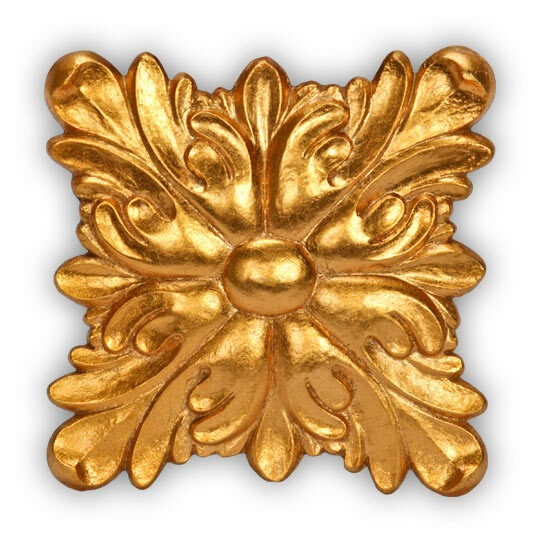 These Gold ornamentals are made with cast resin and polyurethane, then a unique coating of gold . There is even a clear coat finish to preserve and protect the golden exterior. Nails are not friendly to the surface and are not recommended for installation. Any holes or methods of concealing nail and screw holes in the molding are impossible to blend with the gold surface since there are zero viable alternatives to matching it. What remains is to solely utilize construction adhesive and we recommend Loctite PL Premium which can be purchased at your local hardware store. Please take extra care in handling and working on these moldings while completing your project. The item is delicate and susceptible to show every dent and slightest damage. We recommend using a Rustoleum Clear Gloss Lacquer, available at your local hardware store, on any cut edges to prevent peeling and strengthen the gold.